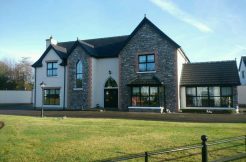 A superior four bedroom detached family home c.2062 sq ft situated on a c.0.5 acre site that enjoys beautiful countryside views on the outskirts of Letterkenny Town. This exceptional home is c. 3kms from Lurgybrack National School, less than 10 minutes drive to Letterkenny Town Centre and local amenities. Currently confirgured as a laundry room, Centre light, curtains, roller blinds, plumbed for washer and dryer, eye and low level units.